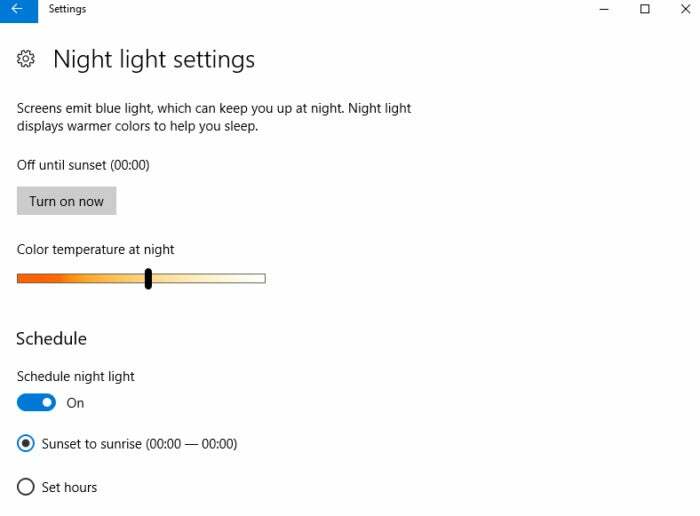 The Creators Update brings a built-in way to adjust your screen's color temperature and make it easier to sleep after a late-night computer session. 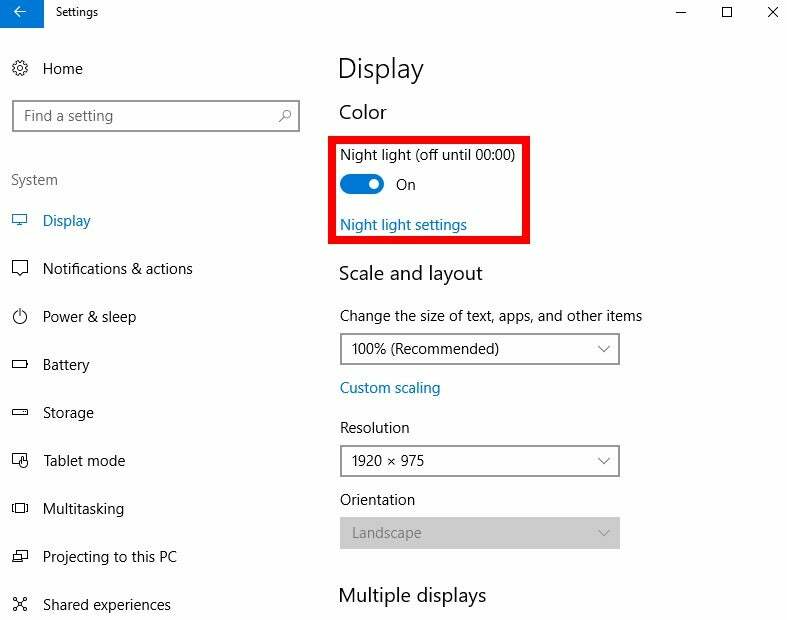 The Windows 10 Creators Update has a new feature that’s supposed to be easier on the eyes and help you fall asleep after a long night of web surfing. It’s called Night Light, and the feature restricts blue light emanating from your display by changing its hue. Studies have shown that blue light at night suppresses melatonin production more than other colors and shifts the body’s circadian timing, thereby disrupting the sleep-wake cycle. Prior to Night Light, users had to turn to third-party software such as the always popular f.lux to address this issue. 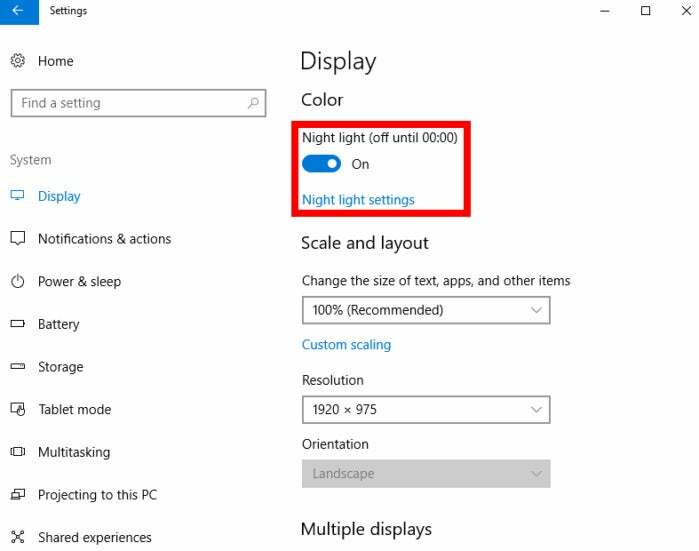 Activate Night Light under Settings > System > Display. To activate Night Light, open the Settings app, and then go to System > Display. At the top of the screen under the sub-heading Color you’ll see the Night light slider to turn on the feature. By default, Night Light activates between sunset and sunrise, and the color change is moderate. 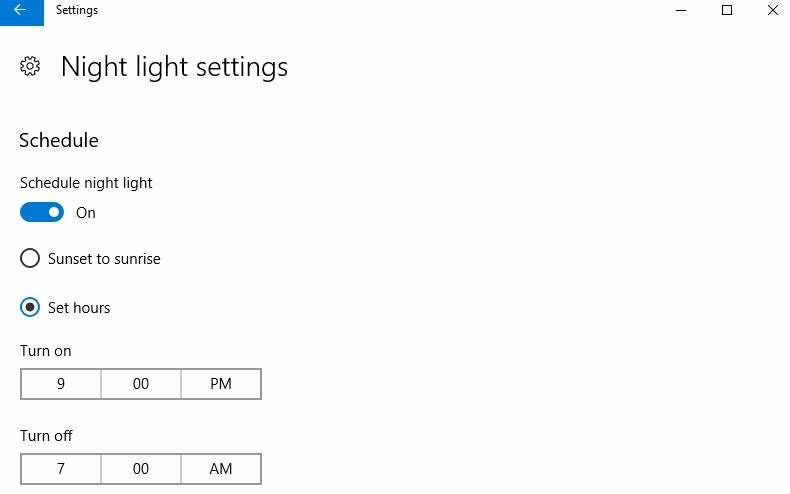 To customize these settings, click on the Night light settings link. The Night Light settings screen. Below that button is a slider to adjust the color of your screen in Night Light mode. The higher up you go on the slider, the less blue light will be restricted; the further down you go the more restricted it is, but the redder your display will become. Night Light can be customized to work during specific hours. If activating between sunrise to sunset doesn’t work for you, you can change the hours that Night Light works by clicking the Set hours radio button. If you don’t see the radio button, turn on the Schedule night light slider first. Now just change the clock settings as pictured here to whatever suits you.